I hope you’re enjoying the fall outfit ideas I’ve been sharing; from sweater outfits and wedge boots, to maxi dresses for fall and the perfect outfit for tailgating. We finally had some relief in the weather here in Texas. I stepped foot outside shortly after waking Sunday morning, and the air was cool, crisp and as perfect as could be. I followed that with a hard workout at the gym, which gave me some energy the rest of the day for errands and housework. The cool weather also had me so ready to start wearing my boots, like these Bjorndal Amy ankle boots from Rack Room Shoes, as much as possible. You’ve seen these boots make their debut already, but I had to show you how great they look with one of my favorite color combinations for fall and winter – white + gray + camel. Just like it’s perfectly fine to wear other neutrals together like brown & black and navy & black; gray, white and camel are three colors that really go well together. Pairing neutrals together is a fashion rule that’s long been forgotten about, just like wearing white after Labor Day. I think I’ve already mentioned how comfortable these boots are, but let me just reiterate it again – they are some of the most comfortable ankle boots to ever grace my feet. The Bjorndal Amy is a cool-weather classic with a supple suede construction and a subtly chic wedge heel. They have a zipper on the inside and a touch of faux fur, which gives them such a great look. I wore these all over the place the other day and am so glad I have these as part of my fall and winter wardrobe. I imagine you’ll be seeing these styled a lot over the next few months. 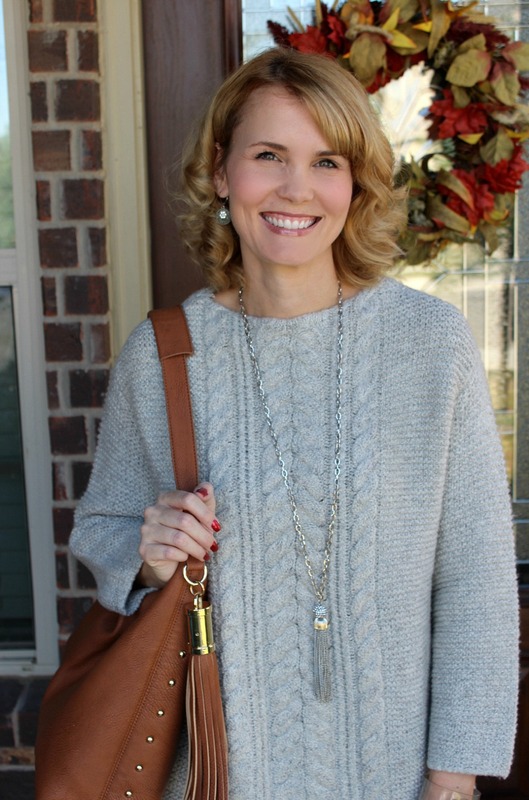 The gorgeous gray sweater I’m wearing is from the J.Jill October collection and it is the softest sweater I currently have in my wardrobe. It’s made with 60% acrylic, 20% cotton and 20% polyester yarn, features a gorgeous cable pattern that’s so classic for winter and is the perfect length. It will look really nice with blue and black denim as well as the white. Are you a fan of wearing white and gray together? Let me know! I freaking LOVE when a bag and a shoe match perfectly as yours does here…SO put together. LOVE LOVE LOVE! Lovely. I saw that cardigan and I honestly thought of you. It looks so soft and adore it with the purse. Yes, I’m definitely a fan of grey and white and those booties pull it all together. 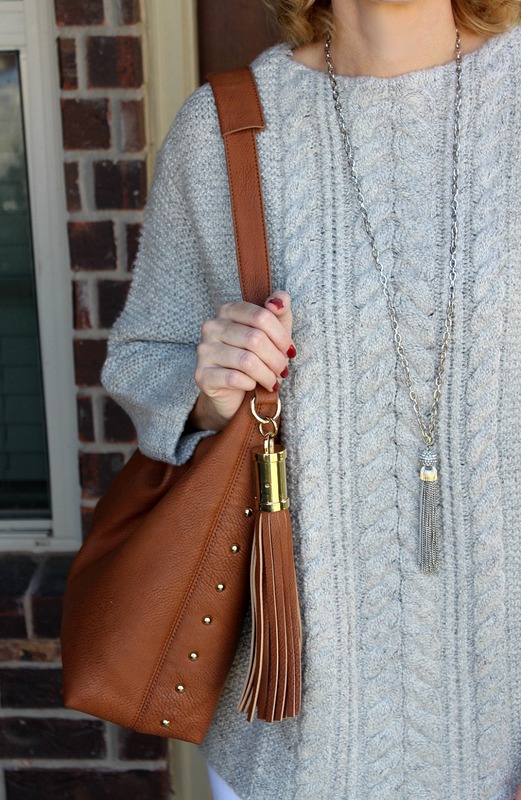 Perfect fall outfit and I love the coordinating boots and bag! Thanks Ellen! I love it when you have two items that go together so well and it’s completely unplanned.